And so it begins. This journey. My first blog. I have spent the last few years trying to become a photographer, trying to make my camera see what I see and then make a picture of it. Some days are better than others. Some. I have had a lot of help along the way. From photographers who are now my friends (more on that later), and from photographers I have never met. I have spent hours and hours studying their work, trying to understand their perspective, to see what they see, to feel what they feel, to appreciate what makes them tick. It takes courage to do what they have done. To have their work scrutinized first by themselves and then put out there for it to be judged by others. For some, the courage to quit their jobs to pursue their passion. They say imitation is the sincerest form of flattery. I must be an exceptionally sincere person, or at least I like to imagine the Ansel Adamses, Henri Cartier-Bressons, Edward Westons and Dorothea Langes of the world would think so of me. They are giants. With size 57 boots. And then there are the more contemporary photographers who I admire too - Steve McCurry, Sam Hurd, Ryan Brenizer, Benoit Rousseau, Joseph Rossbach, Ryan Muirhead to name just a few. They don’t know it, but these people have been my teachers. I have tried to learn their craft, to step into their size 57s, not with the hope of filling them, but to know what it feels like and to learn a thing or two along the way. So I thought I’ll start with a little tribute. My little way of saying thank you to some of these great photographers. A little sincere flattery. I recently spent a few days in New Mexico. Before I went there, I did my homework and found, to my immense delight, that Ansel Adams had spent a great deal of time in that part of the country. 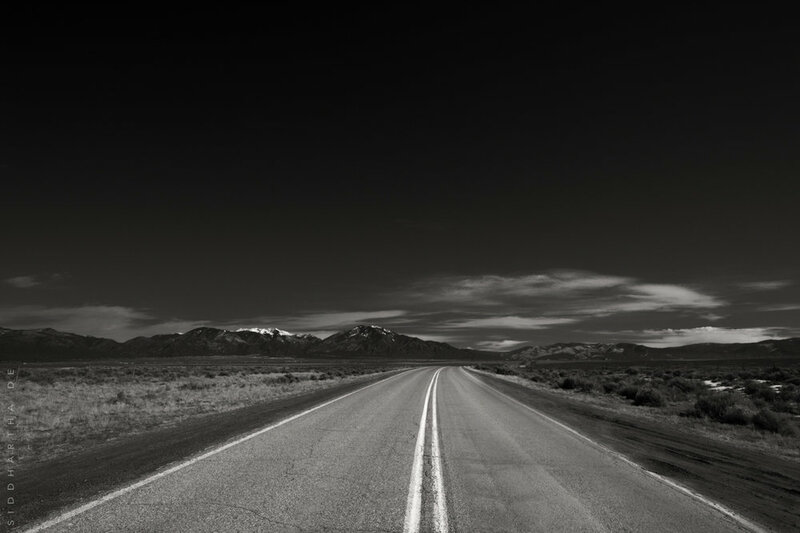 Some of his most famous photographs of the American Southwest have been taken in Northern New Mexico. Adams’ seminal book, ‘Taos Pueblo’, published in 1930, has been described as ‘the greatest pictorial representation of the American West’. Adams’ seminal book, ‘Taos Pueblo’, published in 1930, has been described as ‘the greatest pictorial representation of the American West’. Northern New Mexico hasn’t changed very much since Adams took some of his iconic images there in the 1920s, ‘30s and ‘40s. Many of the old churches and pueblos he photographed still look the same, and the landscape is as stark and spectacular as ever. High desert, sagebrush, adobe, mountains, canyons, brilliant sunlight. The photographs he took had this quality about them: vivid colour in black and white. Most of his pictures were devoid of people, in many cases devoid altogether of any evidence of human influence. Even the pictures of the churches of San Geronimo and San Francisco looked like they were isolated in a time capsule, in the middle of nowhere, like the church in the November Rain video. It was cold in January, despite the strong sunshine. Cold and windy. I went down to Ranchos de Taos, to the old church of San Francisco de Asis, to Taos Pueblo at the foot of the Sangre de Cristo mountains, to the Rio Grande river and gorge, to see what Ansel Adams saw and to try my damnedest to make my camera see the same things. Here, then, are MY colours of New Mexico. I wish Ansel Adams were around. I would dearly have liked to know what he thought of these pictures, and get some tips from the master on how I can improve. 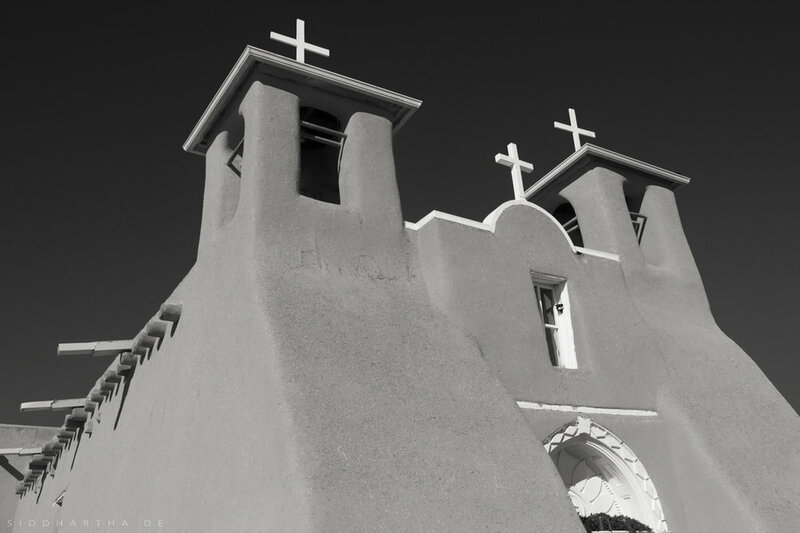 One of Adams’ signature images from ‘Taos Pueblo’ was taken at the church of San Francisco de Asis, at Ranchos de Taos. Adams was captivated by the massive walls and buttresses of the church, saying they “seem an outcropping of the earth rather than merely an object constructed upon it”. Today, the church still commands centre stage at Ranchos de Taos Plaza, and looks very much the same as it did in the 1930s. The trees in front of it have grown though, and the façade of the church is no longer entirely visible from outside the gate as it was during Adams' time. Taos Pueblo, a UNESCO World Heritage Site, is considered to be one of the oldest continuously inhabited settlements in the United States. The church of San Geronimo, within the walls of Taos Pueblo, was built in 1850. The buildings in the pueblo are made of fortified adobe walls that are often several feet thick. One can still see the ladders leaning against the outer walls that in the old days provided the only means of access, via the roof, to the dwellings within. The road to the Rio Grande gorge is spectacular high desert landscape. The barbed wire fencing on either side is a bit of a turn-off (and to a photographer like me, a deterrence to being able to get to some really nice locations), but I enjoyed the outing all the same. The brilliant blue skies sometimes lack drama, but you learn to work with what you have. The adobe architecture blends in with the landscape, and adds to the character of this remarkable corner of the American Southwest. Before I went to New Mexico, I looked up local photographers online, and amongst the many I found, Lenny Foster, in particular, stood out. He has his own gallery in Taos, and I had a wonderful meeting with him there. If you ever are in Taos, I would urge you to take an hour or two of your time to visit the Living Light Gallery near the historic plaza. You could look at his pictures online, but there is a world of difference between seeing a JPEG on your monitor and a professional high-resolution print. Thanks, Lenny, for taking the time to talk to me. I fell in love with New Mexico. I will return there someday. I think Ansel Adams would approve.